Disclosure: This post is sponsored by Goodwill. All opinions are 100% my own. See our disclosure policy for more details. I love anything vintage & especially when you can breathe new life into a treasured piece by upcycling it & giving it a new purpose in your home. Sia & I had the opportunity to attend an Upcycle event last week hosted by Goodwill for influencers in the darling town of Sumner on a mission to find & upcycle an item to turn it into a planter for our home. This was totally right up our alley (Sia is the master upcycler, too, as you’ve probably seen with all of her DIY projects). 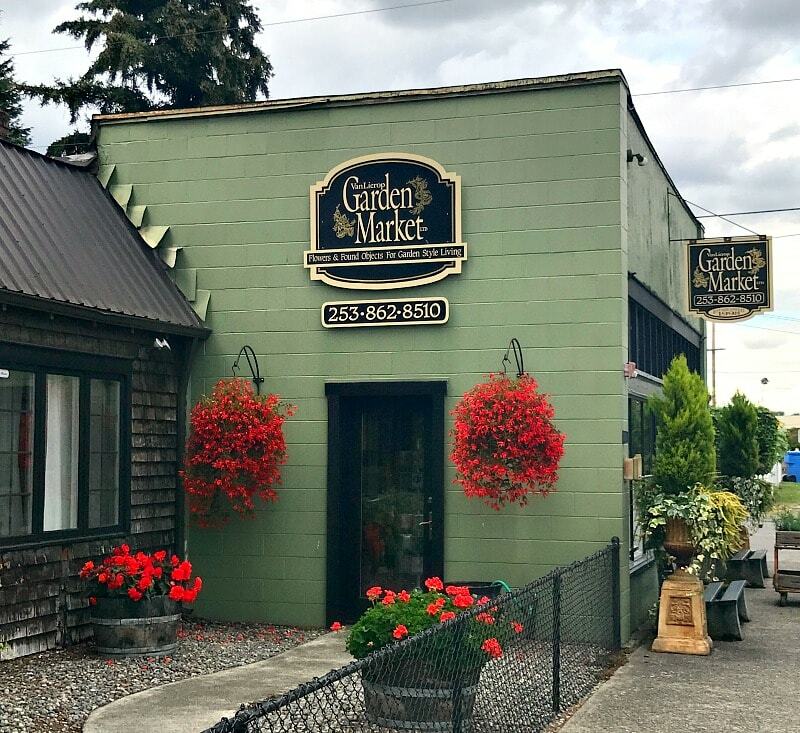 We visited a few Goodwill stores, checked out some fun stores in downtown Sumner for upcycling inspiration & then headed to Van Lierop’s Market to find the perfect plants for our planters. Thrift stores are the perfect place to visit if you are looking for an item to upcycle into a planter. What I love about a thrift store is that it is filled with so many treasures that have come from people from every walk of life. 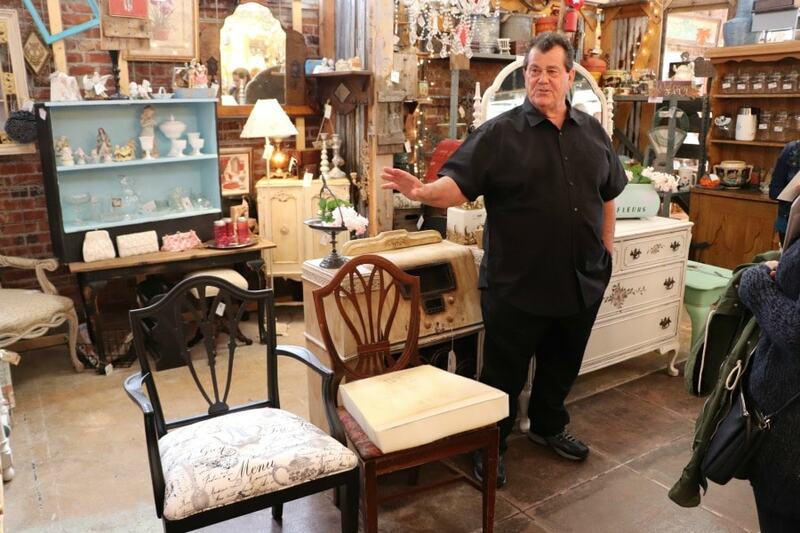 You could find antiques that have been in a family for 50+ years or untraditional items you’d never find anywhere else thanks to a unique collection someone may have kept. Not only will you find such a wide variety of styles from different generations, but you can also repurpose these items by breathing new life into them with a new function. For our first stop on our Upcycling adventure, we visited a local Goodwill for the opportunity to pick an item to repurpose into a planner. Sia & I had the chance to work with Harvey Hamm, who is a professional upcycler specializing in furniture upholstery. He has a great eye for seeing the potential in items, so we had fun checking out all of the home items & looking for ways we could repurpose atypical household items & upcycle them into indoor or outdoor planters. 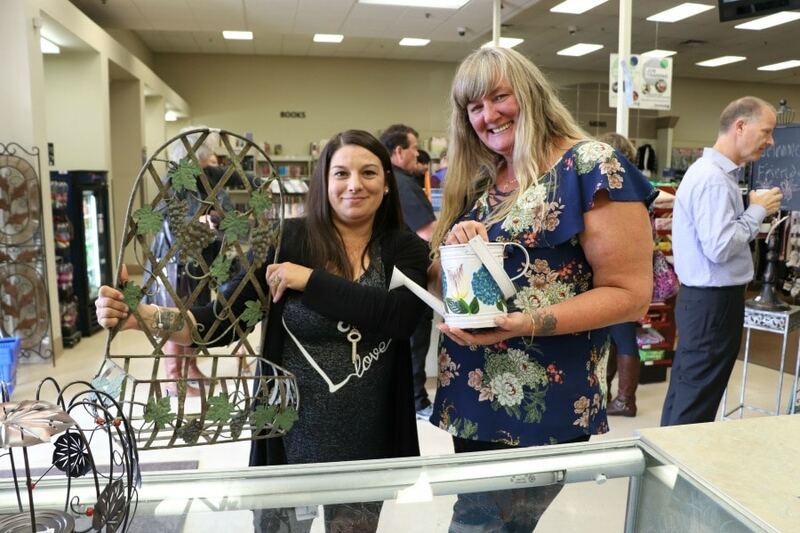 We also had the opportunity to visit the Blue Goodwill store located in Sumner for more hunting for treasures to upcycle. 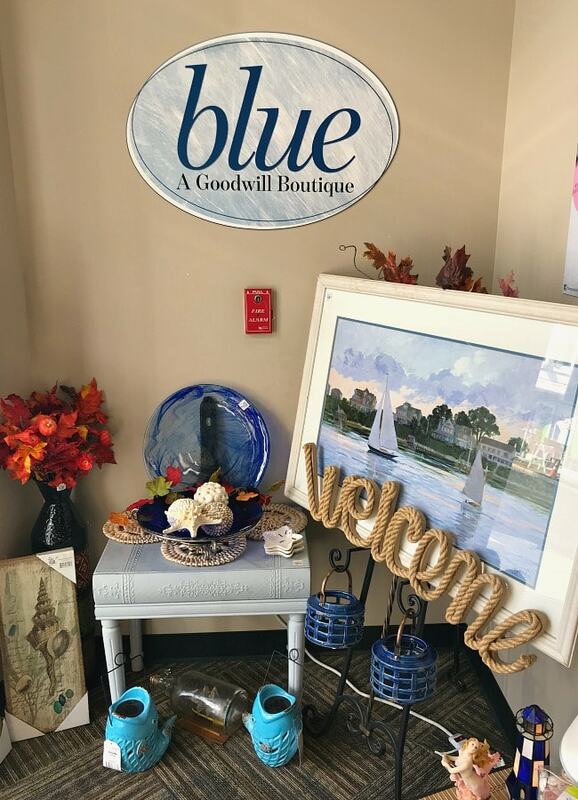 If you’re unfamiliar with the Blue Goodwill stores, they are Goodwill locations that offer high quality brands & designer brands of clothing, jewelry, shoes, purses, and items for the home, but at a lower price than you will pay at full retail. If you are looking for really unique, upscale finds, this is the place to visit. There are 3 Blue locations in the South Sound of WA – Olympia, Tacoma & Sumner. If you really want a bargain, another idea is to head to the Goodwill Outlet store to scour the bins for hidden treasures that you can upcycle. The price is right, as you will pay by the pound not by item, if you want a very inexpensive item to upcycle. There are Goodwill outlets all over the country & a number of them in the NW, including 3 in the South Sound area (Tacoma, Kent & Olympia). The goal for Sia & I on our upcycling mission was to really try to get creative & think outside the box for items which could be used for a planter. We wanted to come up with items that you may not typically think of for planters and show how it could be a unique item to showcase in your home or garden and provide a lot of character & charm. There are just so many items that could be repurposed in a new & creative way when you start to view them differently. 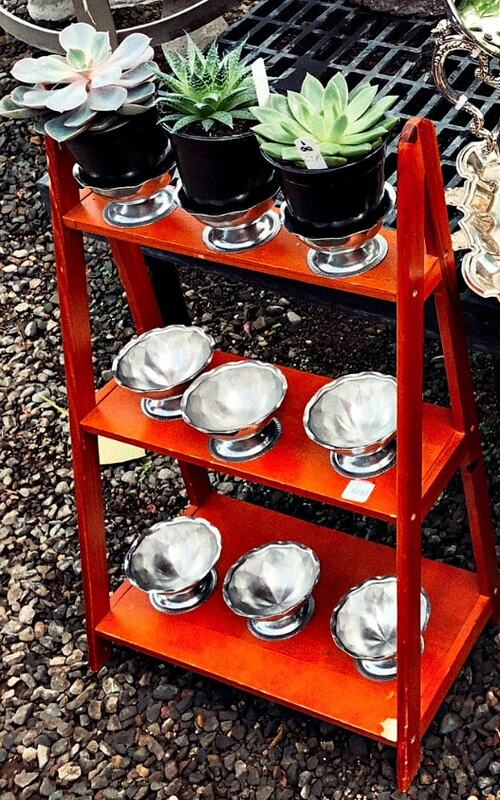 Sia chose this little shelf & then she found these silver dessert cups & picked up enough cups to go across each step. It was all less than $10 total. 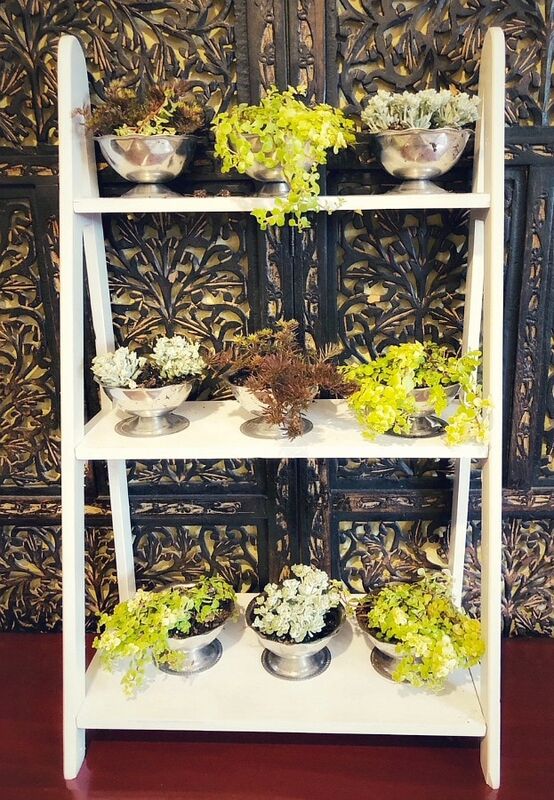 The ladies at Van Lierop’s Market in downtown Sumner then worked with Sia to find a combination of plants that were eye catching & complimented each other to go on each shelf. Sia took the shelf home & painted it white to bring out the colors of the plants even more & it really turned out so striking! I love that these dessert cups are getting new life with a different purpose as plant containers and it really shows off their pretty design. And a fresh coat of paint really livened up this shelf to make the entire planter an eye-catching piece! 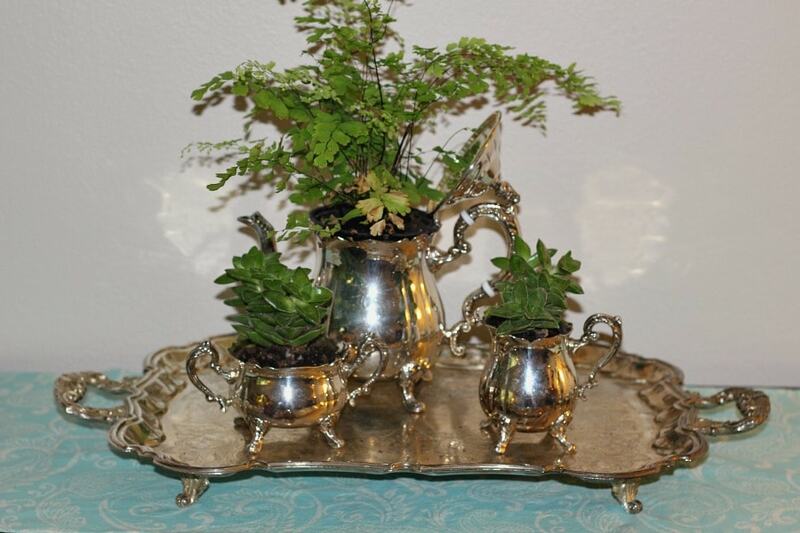 I also chose something unusual to repurpose & upcycle with this silver tea set. I’ve always loved tea sets, as it brings back fond memories of having tea with my grandma using her fine china tea cups on her little tea cart. So, this was a nostalgic purchase for me to bring reminders of having tea with my grandma when I look at the tea pots. Plus, the silver is very durable & long-lasting, so it seemed like a good option to try as planters. I ended up buying the whole tea set, but I like having the option of keeping it all together on the tray or adding a tea pot here & there around the house. I also plan to paint some of the tea set in chalk paint as it would be a better fit for my decor in my home. Our upcycle specialists let me know I can use Krylon chalk spray paint & then just add a wax or poly spray over it to keep the paint looking good with watering/dirt from the plants. 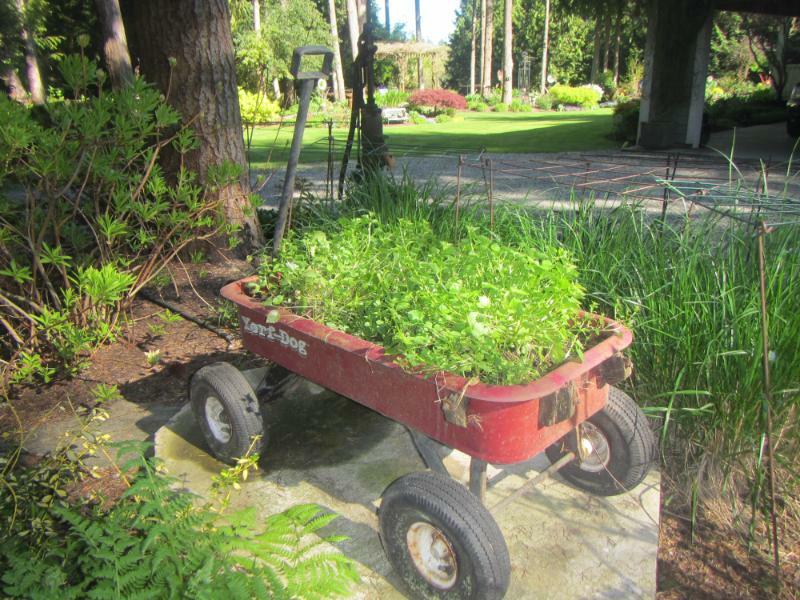 I love this idea of using an old toolbox as a multi-level planter. You can fit all sorts of plants in this planter – this one outside of the Inta-Vintage store in downtown Sumner was filled with succulents & rocks & was so creative! If you have a fruit basket you’re no longer using, turn it into a planter. You’ll want to line it in moss first to absorb the moisture for when you water, but I think this turned out really fun for a succulent planter. 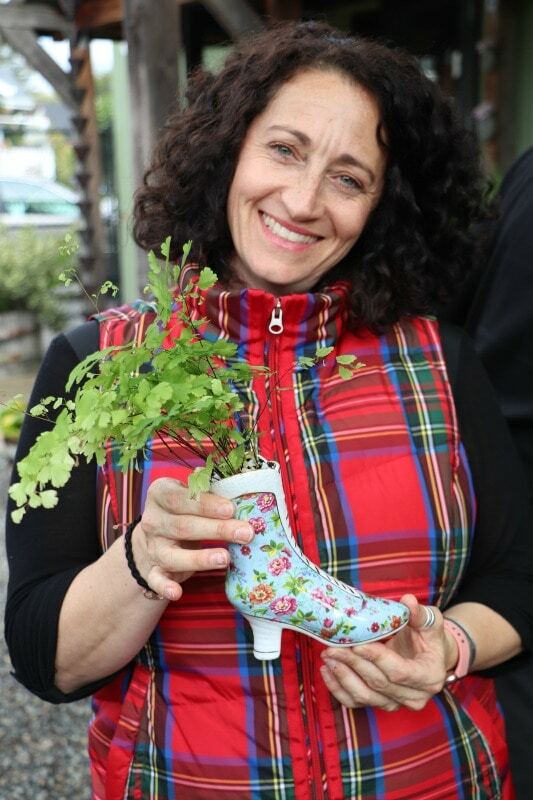 Isn’t this a darling porcelain boot from the Blue Goodwill store? I love how the tall, green plant really gives it new life & makes this indoor plant such a unique conversation piece. 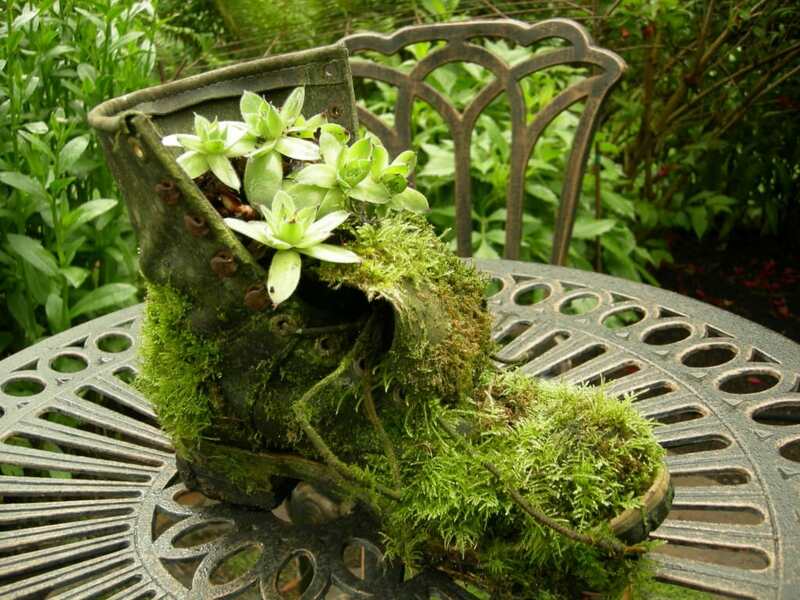 Recycle old leather shoes or head to a thrift store to look for a unique pair of shoes for outdoor garden planters. The other option I used for the sugar & creamer is to use succulents, which need very little water. The gals at Van Lierops thought this would work best for the small pots as they would only need a little water (good for me as I am not the best with keeping plants alive ;) ) & then I could plant them so they could spread out a bit more. The other key factor to keep in mind is the materials & supplies you can use to make a container work that might not seem possible (for example, wire & metal kitchen or home decor baskets with lots of holes). I love the look of wire baskets for planters on my porch or deck, but you do want to make sure that you use the right items with these baskets so they don’t lack for water because of all the holes. 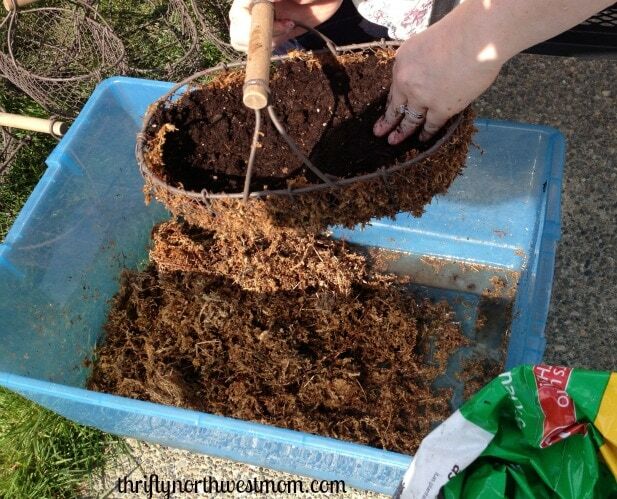 For these types of containers, you can purchase moss to line the baskets. This will help keep that moisture locked in so that you are not needing to water it constantly or have it dry out in the summertime. We have specifics on how to use moss to line your baskets in our post about reusing & repurposing items around your home for planters. As part of our upcycling adventure last week, we had the opportunity to visit a few vintage shops in downtown Sumner. If you are planning any upcycle projects, this is definitely the best place to get started. 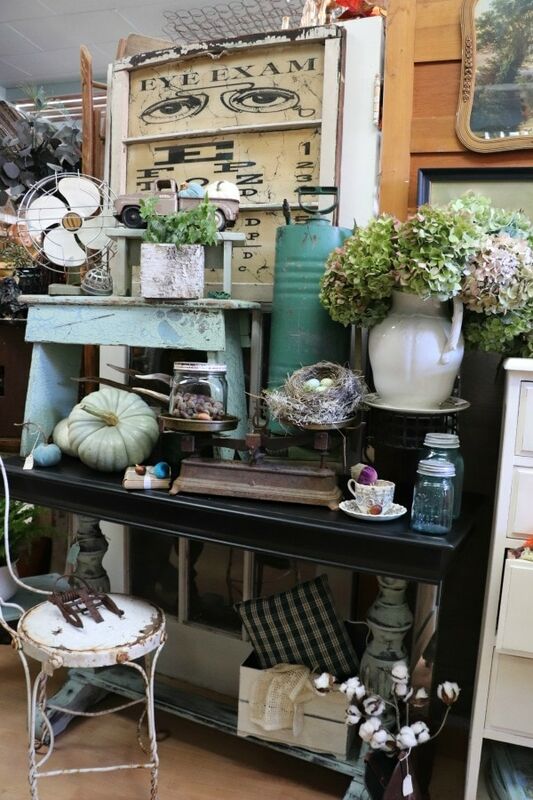 Head to some local vintage shops to see how creative you can get in repurposing items. 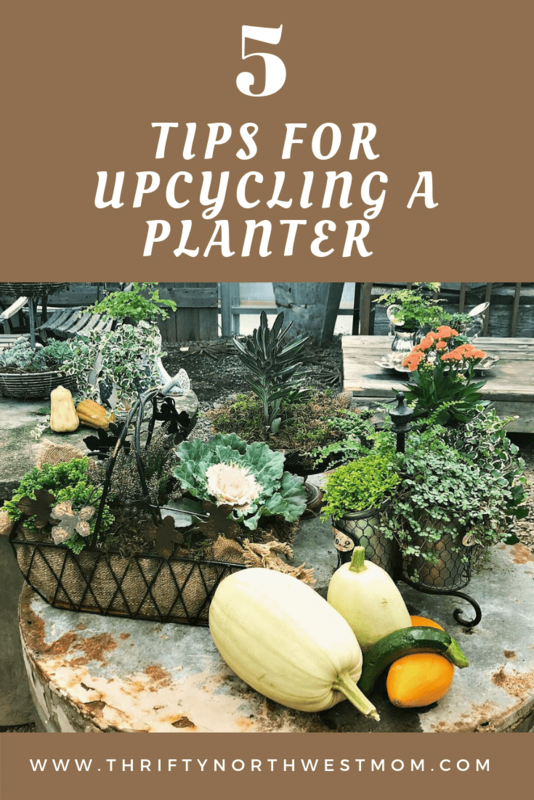 This definitely got our creative juices flowing as we contemplated our upcycled planters, but also realizing how we could reuse more items in our homes & give them a different purpose. Our first stop was to the Junker’s Nest vintage shop & let me tell you, this is the most darling shop! They showed us how to put together this fall display inspired by the light green pumpkin. I love how all of these items coordinate so well with shades of green, brown, & cream for a non-traditional autumn look. I was inspired after seeing they used items from the outdoors, around the home & items found at thrift stores, all paired together in an eclectic assortment. Definitely inspiration for how to pull together items in our homes around our upcycled planters. The Inta-Vintage store features a collection of vendors who rent booths to display their beautiful treasures, all with different upcycle talents. 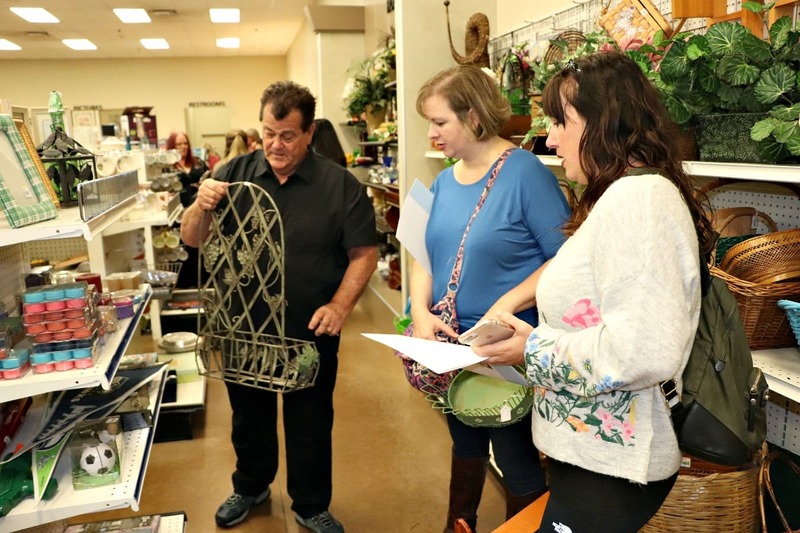 You’ll find furniture given new life with speciality refinishing/painting skills or reupholstered seating, jewelry & clothing items made from recycled clothes & materials often found at the Goodwill outlet, and so much more. I had to go back & visit on my own as it was just filled with so many fun finds. They also sell chalk paint, which I brought home with me, as I was so inspired by these darling vintage pieces in the stores & ready to give new life to some of our old items. 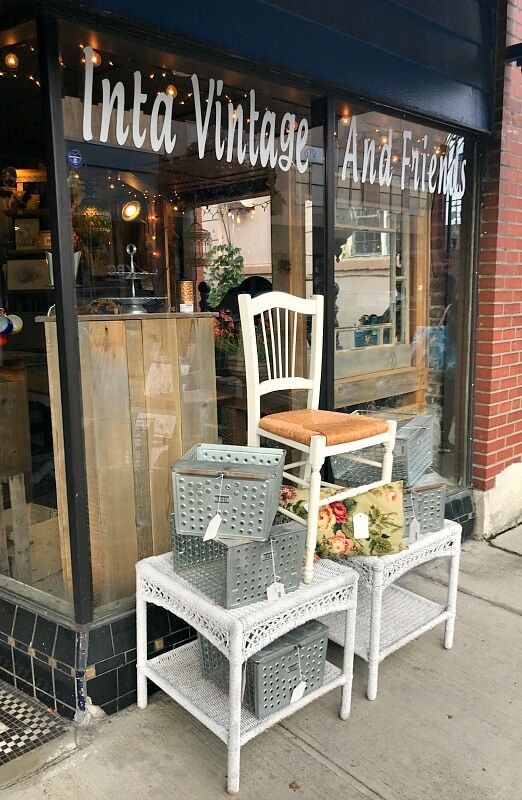 If you do head down to downtown Sumner for upcycling inspiration, make sure to grab a friend and make an afternoon of it! There are so many cute vintage shops to visit along the downtown and you can stay and have lunch or dinner at Sorci’s, an amazing Italian restaurant right in the heart of Sumner and next to Van Lierop’s Garden Market. Sorci’s has been a long-time favorite of ours, due to not only delicious food, but we just love the quaint atmosphere. We had a delicious lunch there for our upcycle event & it was a great ending to a fun day of shopping & learning. Whether you are putting together a planter for inside or outside, your planter will really stand out when you use a variety of plants in different colors & different styles. Mixing succulents with ground cover plants & other perennials can create a lot of depth to the planter with the different layers of colors & texture. I am not someone who has the ability to beautifully arrange flowers or plants, so I was pleased to know that Van Lierop’s Garden Market is very happy to help you put together a planter when you purchase their plants. 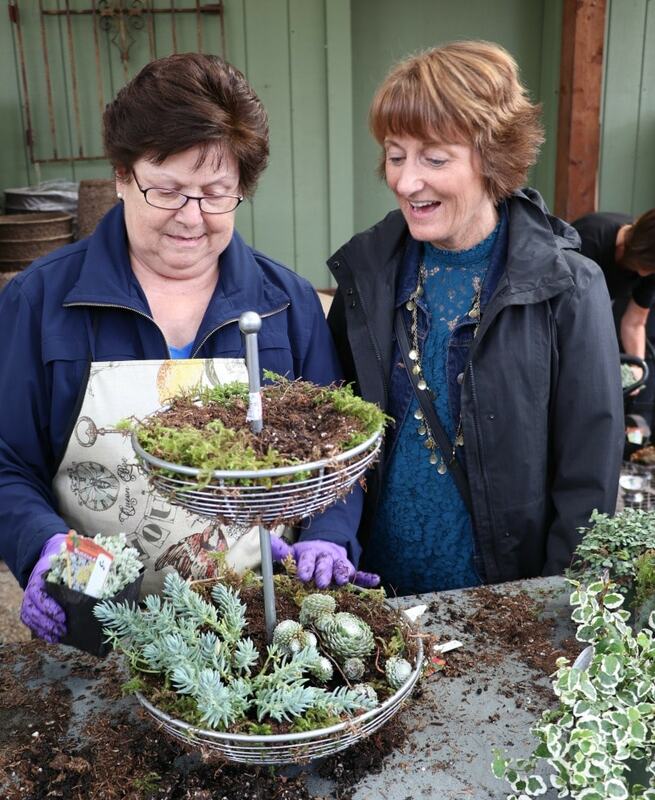 These ladies knew exactly what plants would work best in our different planters & how to highlight the upcycled treasure best with the plants. 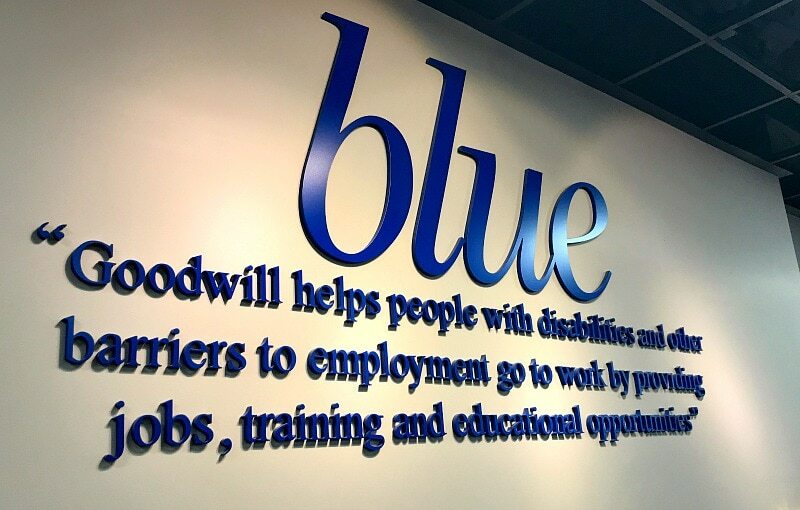 What I really appreciate about shopping at Goodwill is that by making my purchases from their stores, $.91 out of every dollar goes back into the job training, career skills, and job placement program here in my local community. I have had the opportunity to visit the Goodwill Milgard Work Center in Tacoma to see these services in action & have been really impressed by the level of training they provide, as well as the vast number of other resources they connect people to when they visit them. The people served in my community range from at-risk youth, veterans, people with disabilities, seniors, single moms & many more. In 2017, Goodwill served more than 9400 people in the South Sound community with job training & placement services. I love that our shopping is not only helping us save money & find unique pieces to repurpose & decorate our homes, but that we are helping to make a difference in our community with our purchases. Find out more about the job training & placement programs that Goodwill offers at its training centers. We had the opportunity to hear from several women who have gone thru the Goodwill job training & job placement services and are thriving now due to their dedication & hard work. 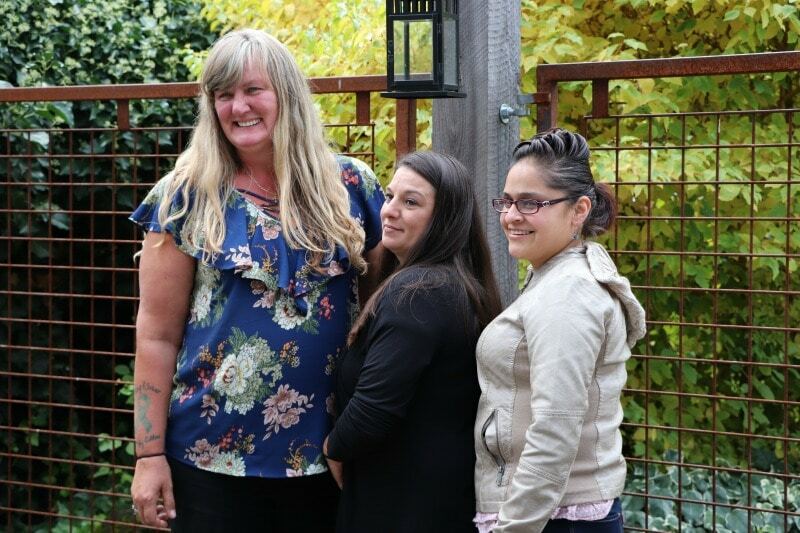 They were at times of significant struggle in their lives & were able to take advantage of the Goodwill programs to give them a fresh start at a new career. 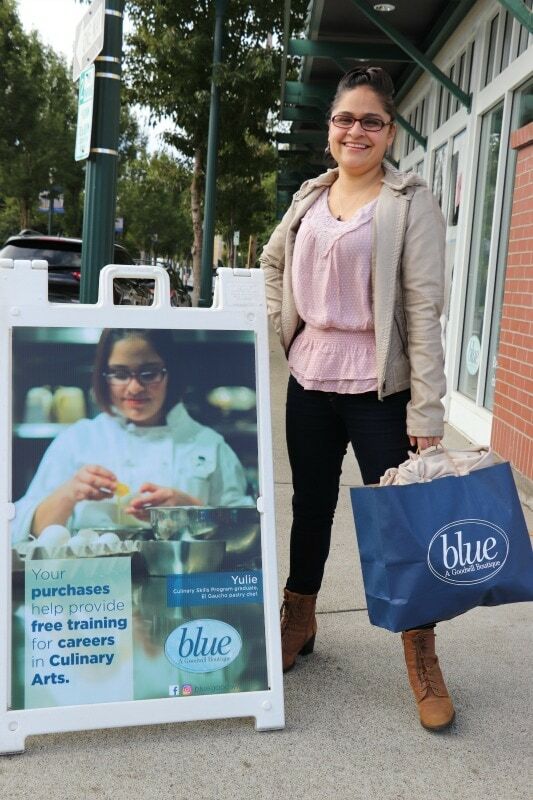 Recent Goodwill Culinary School graduate, Yulie, is now the pastry chef at El Gaucho,a prestigious downtown Tacoma restaurant. 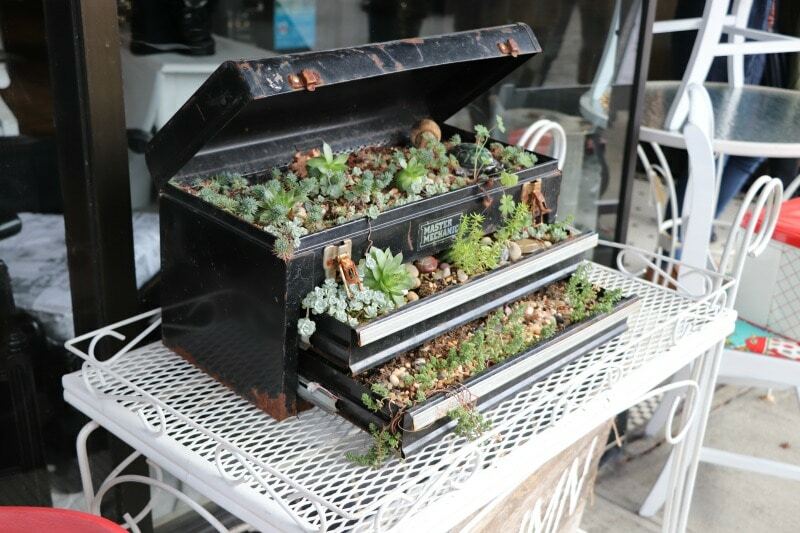 We’d love to hear some of your favorite upcycled planter ideas? Love all the articles with fantastic inspiration! Thank you so much for taking the time to Blog! I had no idea about the “blue” stores! I love a good bargain, so might need to check that out asap! Entertainment Book Sale – All 2019 Books $10 + Free Shipping! Audio Books Rental – 30+ Popular Audiobooks for Audible – The Night Tiger, The Life-Changing Magic of Tidying Up, Life Will Be the Death of Me & more!